22 year old ironmonger whose parents and siblings are healthy. Sickened 2 years prior without verifiable cause. First appearance supposedly in the legs. It came to pass for him that he could not quite step forth on the heels, and had to walk more on the forefoot and toes. The pictures that were taken mid stride show, from the front and the side, the patient in the act of a pronounced tiptoeing. The taliped state is produced by a high grade loss of mm. peron. and tibial. antic. with accompanying spast. contracture, even though with a proportionately lesser atrophy of the plantarglectors. The thigh musculature looks, both sides, high grade atrophic. The second figure, taken from the back, may be recognized for the highly characteristic way in which the patient can no longer flex the forward stepping leg at the knee. It moves only at the hip joint, in an arching manner, so that the leg describes a convex bowline to the outside. 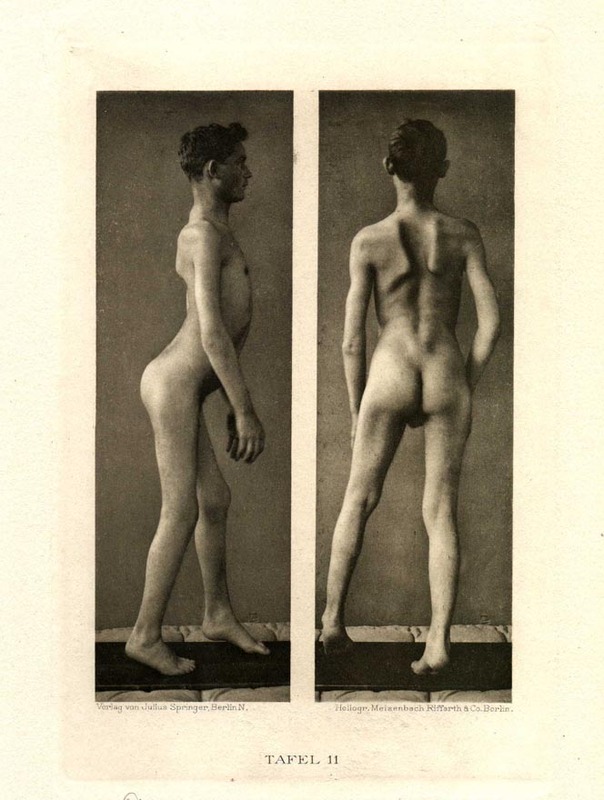 The back of the figure shows further the appearance of the pervasive atrophy of the shoulder musculature, and particularly that of the emerging serratus palsied condition of the shoulderblades. The figure photographed from the side may be recognized for the considerable loss of the musculature of the upper arms, for the more normal strength and shape of the forearms and hands, which are also, correspondingly, altogether serviceable. In the rare body will develop a lordose of the lumbar vertebrates that is a consequence of the atrophy of the waist and back ligaments and through which the belly stretches broadly forward, the pelvis to the back, to appear in a true saddle configuration. It is also a consequence of this monstrous placement of the torso that the vertically held arms of the patient do not lie along the flanks as with the healthy, but rather hang in front of it, free in the air.